Fuel and energy resources of the Baikal basin are represented by deposits of solid fossil fuels (black and brown coals of different ranks), oil shales and uranium. Coal deposits are confined to the Upper-Mesozoic depressions of the Transbaikalian type, the most significant of which are the Tugnuiskaya, Gusinoozerskaya, Udinskaya, Chikoiskaya and others. 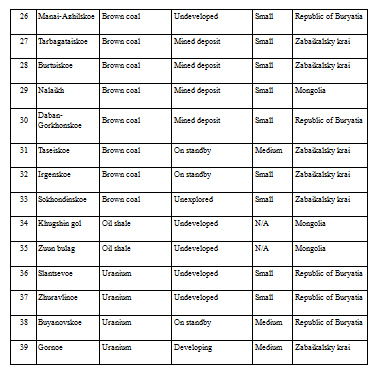 The main reserves of black coals within the territory under consideration are concentrated in the Erdem-Galgataiskoe, Krasnochikoyskoe, Nikolskoe, Olon-Shibirskoe, and Zashulanskoe deposits, while the reserves of brown coals are localized in the Gusinoozerskoe, Zagustaiskoe, Taseiskoe, Sharyngol, and Ulaan-Ovoo deposits. The largest deposits are located in economically developed regions with an extended infrastructure, including the presence of traffic arteries in the form of railways and auto-roads. Out of 33 coal deposits, located within the territory of the Baikal basin, sixteen are currently under development. 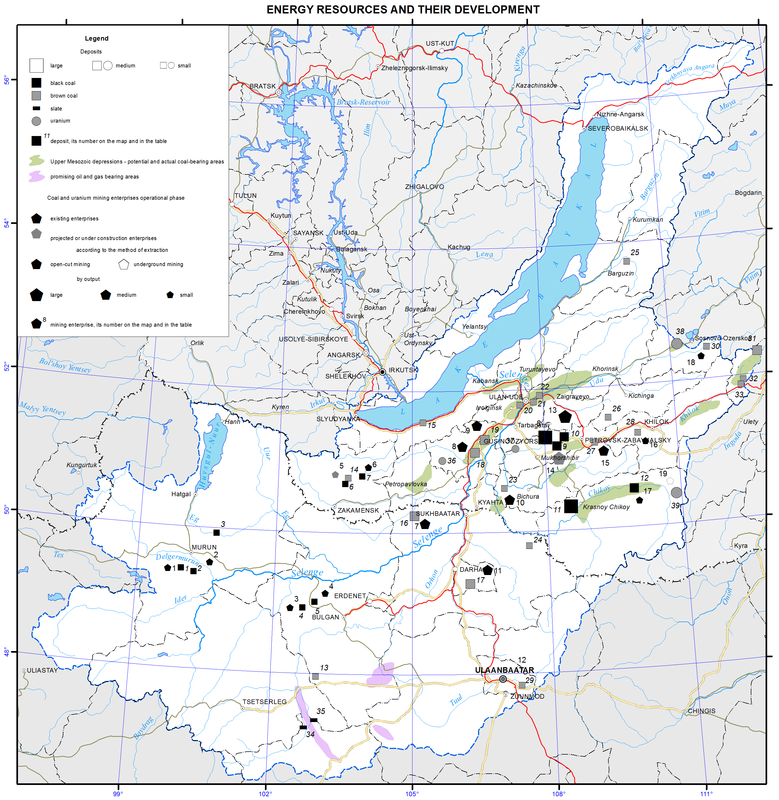 To date the largest coal producer not only in this area, but in the entire East Siberia and the Far East is the Tugnuisky open-pit coal mine, which mines the Olon-Shibirskoe deposit (97% of the reserves occur within the Petrovsk-Zabaikalsky municipal district of Zabaikalsky krai, and 3% are deposited in the Mukhorshibirsky district of the Republic of Buryatia). Due to the introduction of the cutting-egde high-efficiency equipment produced by the world-renowned manufacturers, coal extraction here more than doubled in three years reaching about 13 million tons in 2012.A coal-preparation plant equipped with unique technologies was built in order to increase marketability of the produced coal. Currently, the capacity of this plant has reached nine million tons. Coal is mainly exported to Japan, Korea, China and other APAC countries. The coal industry of Buryatia experienced a significant decline after closing in the early 1990s of the major coal producers of the time such as the Kholboldzhinsky open-pit mine and the Gusinoozerskaya mine (Selenginsky district). Currently, the OAO (Open Joint Stock Company) “Ugolnaya kompaniya Bain-Zurkhe” holds licenses for the Bain-Zurkhe and Kholboldzhinsky sites of the Gusinoozerskoe deposit. This company has resumed the coal feed from the deposit to the Gusinoozerskaya state district power plant. A radically new development technology – a highwall mining complex is applied. There is a gradual growth in coal production (932 thousand tons in 2012). Over the recent years, the OOO (Limited Liability Company) “Ugolny razrez” mining the Okino-Klyuchevskoe brown coal deposit in the Bichursky municipal district of the Republic of Buryatia has expanded its production capacities. It is expected to increase the capacity of this enterprise to five million tons per annum and continue the construction of the railway spur to the Khoronkhoy station for coal conveying to the Gusinoozerskaya state district power plant. Besides, in order to provide the thermal energy facilities of the Republic of Buryatia with the locally produced coal, a construction of a large Nikolsky open-pit mine along with a coal-preparation plant on the basis of the balance reserves of the same-name coal deposit is planned. In the Selenginsky municipal district the OOO (Limited Liability Company) ”Buryatugol” currently develops the Zagustaiskoe deposit. It produces more than 200 thousand tons of brown coal per annum. 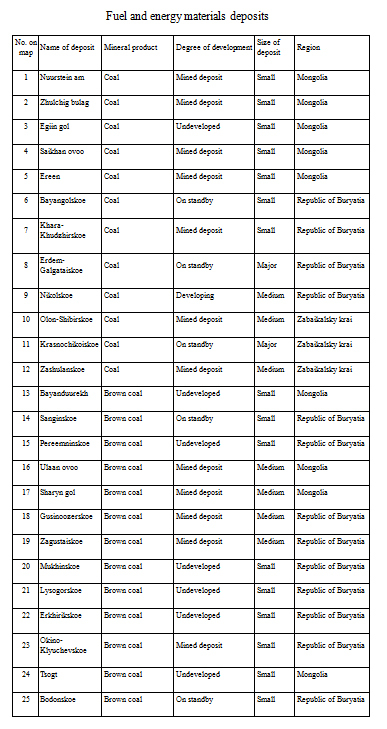 The remaining coal producers of Zabaikalsky krai and the Republic of Buryatia within the territory of the Baikal basin mine small volumes (10-50 thousand tons per annum), mainly for housing and public utility sector needs. They are the Daban-Gorkhonsky, Khara-Khuzhirsky, Zashulansky, and Burtuisky open-pit mines. An exception is the OOO (Limited Liability Company) “Razrez Tigninsky” developing the Tarbagataisky deposit in the Petrovsk-Zabaikalsky district. In 2012 it produced 260 thousand tons of brown coal significantly exceeding the level of 2010-2011. All coal is extracted by open-cut mining. Mongolia's oldest coal producer is the “Nalaikha” mine where small scale extraction was launched in 1912. After the reconstruction in the 1950s the capacity of the mine was brought up to 600-800 thousand tons of brown coal per annum. The mine is the economic mainstay of the town of Nalaikh and was originally the only source of fuel for thermal power plants under construction in Ulaanbaatar. After the official mine shutdown due to the impossibility of its safe operation the former professional miners became engaged in artisanal mining on the facility. The Sharyngol brown coal deposit was discovered by Soviet geologists in the 1930s, but the development of the deposit began only in 1961, after additional exploration. In the 1980s, the open pit capacity reached the maximum values ​​of 2.5 million tons per annum. Currently, the company is privatized; in 2010 the production was about one million tons and open-cut mining is used. In the Selenge aimak, the Ulaan-Ovoo high-energy brown coal deposit is currently developed. At the moment the Canadian company “Prophessy Coal” holds the development license of this deposit. Coal mining began in 2010. Small scale coal mining is underway on Zhulchig bulag, Nuurestein am (Khuvsgel aimak), Saikhan ovoo and Ereen (Bulgan aimak) deposits. Nowadays two small deposits of uranium raw material (Slantsevoe in the Dzhidinsky municipal district and Zhuravlinoe in the Mukhorshibirsky municipal district of the Republic of Buryatia; both deposits belong to the Selenginsky uranium ore region; a preliminary exploration was conducted on the deposits), and two medium ones, namely, Buyanovskoe in the Eravninsky district of Buryatia (Eravninsky uranium ore region; the deposit is on government standby) and Gornoe in the Krasnochikoysky municipal district of Zabaikalsky krai (Chikoysky uranium ore region) are known within the boundaries of the Baikal basin. The latter deposit is prepared for industrial development to produce natural uranium concentrate. It is planned to construct an underground mine and a heap leach pad for processing mined uranium ore. Besides solid fuel the territory of the Baikal basin, was recognized as promising for the discovery of commercial deposits of raw hydrocarbons, especially natural gas within the Selenginskaya and Ust-Barguzinskaya rift troughs. According to the results of the prospecting and evaluation works carried out in the Ust-Selenginskaya depression in 1955, 1962, and in the 1990s, its prospective hydrocarbon resources were estimated at 364 million tons of oil, and 520 billion m3 of natural gas (C3 category). Prospect assessment works on the Barguzinskaya depression are in progress. Due to their small scale and low resin content (8-10%) oil shale deposits are of no commercial interest. 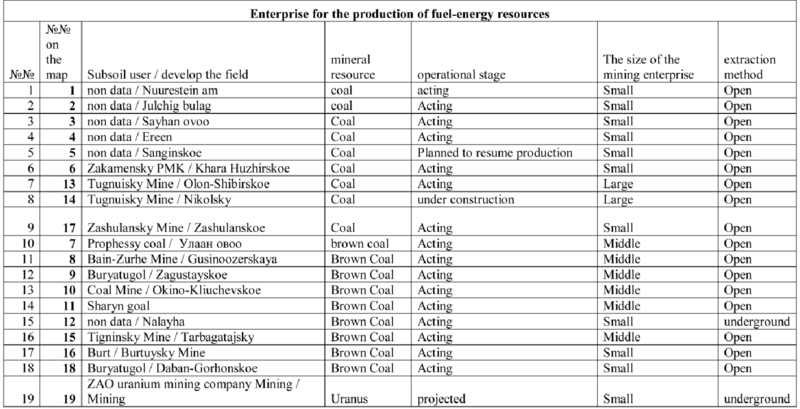 The map “Fuel and energy resources and their development” displays deposits of solid fossil fuels (black coal, brown coal and uranium) designated by various symbols. The symbol size is determined by the size of a deposit. Mining companies are also shown using symbols. The symbol size depends on the average production output over the last 3-5 years (for operating enterprises), or on the design capacity (for companies projected or under construction). The following ranking of enterprises was adopted: large ones with the production of over one million tons, medium ones – from 100 thousand tons to one million tons, and small ones – less than 100 thousand tons per annum for coal mining enterprises; the projected uranium mining company “Gornoe” is a small one with the production of less than one thousand tons of uranium per annum. Circled symbols show the underground mining method, while color indicates the operational stage of an enterprise (operating or projected and constructed). Areals depict the Upper-Mesozoic depressions - potential and actual coal-bearing regions and prospective oil and gas areas.